We all know that the 5 components of nature(Air, Water, Sun, Earth, Sky) are responsible for the creation and sustenance of life i.e. all creatures on earth. The earth with the help of solar heat, rain water, the air in the atmosphere, develops vegetation on her under the roof of sky, which is the main source of food for all creatures on earth. The water reaches the earth by the way of rain from clouds, which are formed by sea water with the sun heat. So the rain water is a very important precious element in the growth of paddy and trees which supply the food to the human beings as well as for all animals and living creatures. Therefore it is necessary to store all the rain water fallen in the agriculture field itself, so as to use it to grow crops, as and when necessary .out of 100% rain water,15% of rain water is going as evaporation, another 15% of rain water is going as transit evaporation and only 15% of rain water getting absorbed by ground and the balance huge chunk of 55% of rain water, a huge quantity, is going waste as a run off into rivers and finally into sea, due to the carelessness and lack of awareness farmers, . Therefore it is necessary to create awareness among the farmers in harvesting the rain water in their fields itself and the responsibility lies on government. The earth ground soil has a very good character of storing the rain water to the extent of 30% of its soil volume. Therefore we must make use of this character of earth and store all the rain water in the agriculture field itself to the extent of saturation, i.e. we have to create an underground reservoir in the agriculture field itself. To harvest the rain water in the ground i.e. agriculture field, we have no of methods as described below. 1. Surface Water Tanks, or Reservoirs: The tanks are formed by constructing an earthen and masonry bund, with surplus arrangements to any local stream. These tanks are in use, sincere ancient days and the India flourished a lot by these tanks by way of storing rain water during monsoons and using it to crops as and when required, during crop period. By this tanks not only the water stored on the surface, but also on the ground to use during summer days by digging deep wells, in the surrounding area of tanks. 2. Contour Trenching: The water stored in the Tank will supply water to fields below its level only, even though the rain of up stream catchment area is stored. To use the entire rain water rained in the agriculture field, it is necessary to store entire rain water by way of digging contour trenches of size 1 mt. width x 1 mt. to 1 ½ mt. depth across the slope of agriculture field, at the spanning of 50 meters, duly giving intermediate breaks for every 30 metres, for the passages tractors, men and animals. By this method entire rain water will be absorbed and stored in the earth (soil) to the extent of its saturation. We can top this ground water as required by digging small wells, or drilling bore wells of just 100 meters. depth, by fitting pump. By this method, a farmer can achieve self-sufficiency in irrigation water needs. The ground water drawn during the dry period is again, filled up during the next monsoon rains. So that the irrigation water is assured for the next year crops. There is no meaning in letting the rain water go waste from agriculture field, by way of run off and later trying to bring irrigation water from rivers duly constructing dams and canals, which are very costly and time-consuming resulting late growth. As there are no common canals, there will be no water disputes among farmers, and the farmer is independent to meet his irrigation needs. Every drop of rain water is a gift given by the God to the farmer, and hence forth he should not let out even a drop of rain water go out of his field duly harvesting it in his field only. 3. Bunding the fields: In case the agriculture land is totally at one level without slope, closed bunding of the field for each acre will give good results, duly harvesting the entire rain water in the field. Half a metre bunding is sufficient to store even the heavy rain water. 4. Trenches around hillocks: By digging the contour trenches of size one meter. width x 2 meters. depth with intermediate breaks all around the hillock will give very good results by storing abundant rain water in the adjacent fields of a hillock. 5. 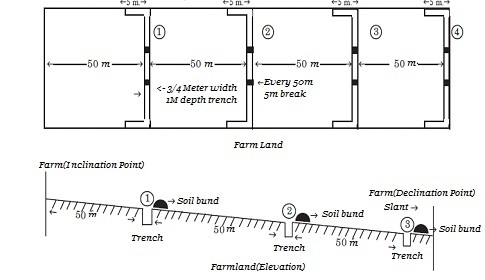 Trenches in village tanks: If a contour trench of size 50 meters long x 10 meters. width x 10 meters. depth with slopes two sides are dug in the village tank. The ground water will improve more effectively and this trench will also provide water to the cattle during the summer. 6. Water Shed Tank: If in every water shed or percolation tank, a contour trench of 1m x 1 ½m x 50 meters. is dug, the ground water can be developed more efficiently with a meagre expenditure compare to the cost of water shed structure. 7. Ploughing of agriculture land during summer: If the agriculture land is ploughed during summer just before monsoon across the slope of the agriculture field, substantial rain water will get absorbed by the soil effectively. 8. Rain Water Harvesting Pits: If the rain water harvesting pits are provided in every house, at four corners, with the size of 1mt width x 1 ½ mt. depth x 1 ½ mt. length, duly filled up with big size stone aggregate of size 80mm size up to 40% from bottom, and with 20mm store aggregate up to another 30% and with, rough sand for the balance 30%, The entire rain water collected on the roof of the house can be harvested, resulting good ground water in the house premises itself. This water can cater to the entire needs of the house for an entire year. For a house of plot size 500 meters., with 70 cms rain fall per annum, the water that can be harvested is 500 x 0.7 = 350 cubic meters; which is sufficient for a house of 20 members for the entire year. Taking the water requirement per head at 50 litres/day. By adopting the above, methods we can harvest the entire rain water with very minimum cost and get maximum benefits. Minor irrigation tanks, not only store the surface water for use of crops but also improves ground water in surroundings. Therefore minor irrigation tanks need immediate reconstruction and development to store the rainwater without allowing it to go waste as a runoff. To improve the percolation further more efficiently, we should dig a Trench Well of size 50mts. length x 10 meters. width x 10 meters. depth with slopes on both sides, in the tank. The soil excavated by digging trench well should be used to strengthen the tank bund so that the maintenance expenditure can be eliminated for at least 10 years. The trench well in addition to improvising ground water can provide drinking water to the cattle during summer. The quantity of excavated soil. 100 x 10 + 90 x 10 x 10 = 12000 Cubic.meters. 1. Cost of excavation of trench well = 12000 x 47.50 = 5,70,000.00 at 47.50 per cubic meter. 2. Cost of Transportation of excavated soil =12000 x 28 = 3,36,000.00 at INR.28/ cubic meter/ 1 km. By spending INR.10,00,000.00, we are not only strengthening tank bund, duly avoiding maintenance expenditure for at least for 10 years, but also improving the tank ground water capacity to the greater extent, in addition to providing drinking water to cattle.